Crock Pot Salty Sweet Crunchy Goodness - Recipes That Crock! Oh my dear friends! You are gonna LOVE me for this one! 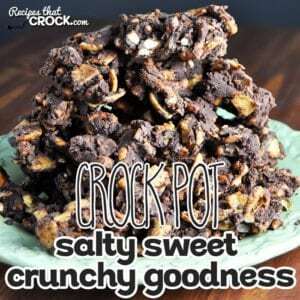 This Crock Pot Salty Sweet Crunchy Goodness is going to cRock your world! Yum! I LOVE when I have a recipe that I can get all excited about and can’t wait to share with you guys! 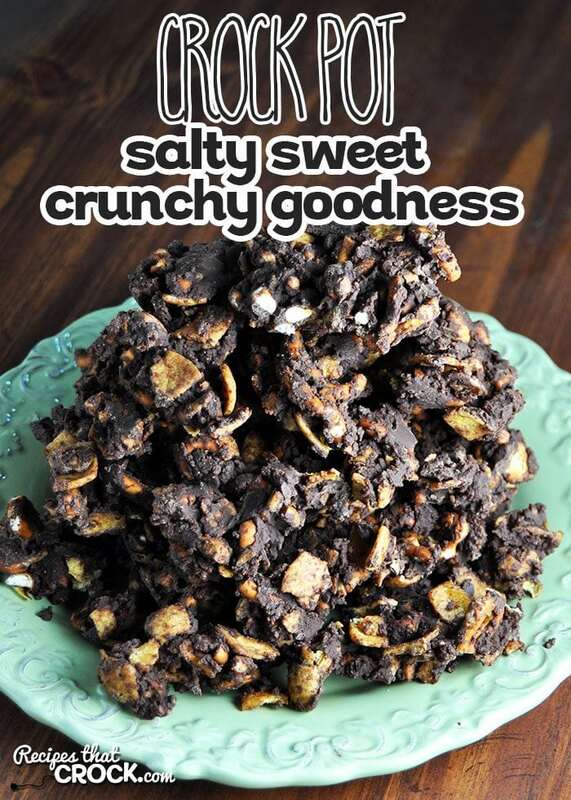 THIS Crock Pot Salty Sweet Crunchy Goodness from Gooseberry Patch’s Slow Cooker Christmas Favorites is just that! It reminds me a little bit of my favorite snack when I was a kid…Puppy Chow. No, Momma didn’t feed me dog food or dog snacks growing up, it is just what they called it. And I LOVED it! Break it into pieces after it is set and enjoy! This is the PERFECT recipe to do with your kids…even preschoolers. I measured everything out, and Ryder was absolutely thrilled to pour it in for me and mix it all up. As soon as I saw this Crock Pot Salty Sweet, I knew I was going to use Sir Hamilton (my Hamilton Beach Programmable Insulated Slow Cooker). Not only is it reliable and easy to clean, with Ryder wanting to watch this recipe like a hawk, I love that the outside is insulated, limiting the parts that he would get burned by if his curious little fingers reached out. Another reason Sir Hamilton was perfect for this is that at the end you have to pick up your insert and pour the mixture out onto a lined cookie sheet. With Sir Hamilton’s light insert, I didn’t have to worry about my bad wrists hurting me when I held it with one hand. Can you tell I love this crock pot? 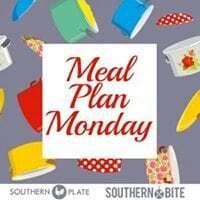 This Crock Pot Salty Sweet is perfect for dessert, sweet treat or for any party or holiday meal! This is the PERFECT recipe to do with your kids...even preschoolers. I measured everything out, and Ryder was absolutely thrilled to pour it in for me and mix it all up. As soon as I saw this Crock Pot Salty Sweet, I knew I was going to use Sir Hamilton (my Hamilton Beach Programmable Insulated Slow Cooker). Not only is it reliable and easy to clean, with Ryder wanting to watch this recipe like a hawk, I love that the outside is insulated, limiting the parts that he would get burned by if his curious little fingers reached out. Another reason Sir Hamilton was perfect for this is that at the end you have to pick up your insert and pour the mixture out onto a lined cookie sheet. With Sir Hamilton's light insert, I didn't have to worry about my bad wrists hurting me when I held it with one hand. Can you tell I love this crock pot? OOOOO – I would really scarf on this easy sweet n salty treat. So glad you shared!! I am so happy that you include Mikey’s church songs on Sunday in the email with your recipe. I listen to them every week. “Because He Lives” is a favorite of mind. Mikey did a beautiful job singing it. It touched my heart. Thank you.